If people started adding quirky, fun pieces of information to their resumes, I would list "Marshmallow Roasting Perfectionist" to my set of skills. Seriously, ever since I was a little kid, camping with my family or having backyard fires, I have been fine tuning my marshmallow roasting abilities. There is nothing better than a perfectly golden crisp outside bursting with ooey-gooey melted marshmallow inside. I will never understand those of you who enjoy, as I like to call it, the 'quick and dirty' method of catching the marshmallow on fire and then rushing to blow it out before the whole thing turns to dust! My summer job during college was working as a counselor at a Girl Scout camp, where we were required to build campfires the "all-natural" way, using birch bark and teeny tiny twig tee-pees to get our campfires started. At least we got to use matches! Although, there was usually a contest amongst the staff to see who could have the most "one match only" fires each summer. The camp ran for six weeks each summer with a lunch cookout every Wednesday and then an optional overnight for older girls on Thursdays that included another cookout. So twice a week, the staff was building fires and cooking over them for the campers. We made lots of the typical burgers and hotdogs, english muffin pizzas, and even quesadillas over the fires, but dessert was always the favorite. Banana boats (bananas cut in half, loaded up with marshmallow and chocolate chips wrapped in foil and set on the coals to get melty), or cinnamon roll sticks (Pillsbury crescent roll dough dipped in butter and cinnamon sugar, wrapped around a foil lined stick and roasted) were pretty well liked by the campers, but nothing beat the good old fashioned s'mores! Just the thought of s'mores at the weekly cookout was enough to keep any camper crankiness at bay :) I spent a lot of time working with 5-7 year olds and many of them unintentionally fell into the 'quick and dirty' category of roasting marshmallows which usually led to very unhappy campers. I can't tell you how many times I heard another counselor say "go ask Luna (I'll explain in a minute) to roast you another marshmallow." I would guess that I roasted several hundred marshmallows over the three summers that I worked at the camp, so needless-to-say, my marshmallow roasting skills are pretty much perfect to this day! The secret is all in the placement and rotation. Hold the marshmallow down near the super hot coals, out of the flames and rotate a quarter turn ever few seconds. With just a little patience, you have a perfect marshmallow every time. Oh and if you were curious about the name "Luna", all of the counselors had to choose "camp names" for themselves as part of the camp's traditions. It was always fun for the campers to guess what our real names were, but we never revealed them. I have always been fascinated by the moon, so I chose the name Luna. Working at that camp has so many wonderful memories. Every summer since then, I think fondly about what a great summer job it was! 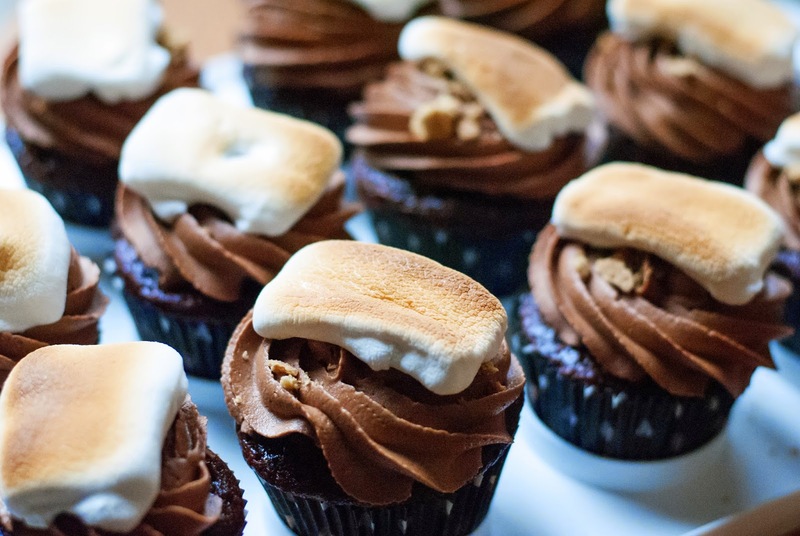 These cupcakes taste exactly like a s'more, just in cake form. The sweet, rich, tender cupcakes are bursting with the creamy marshmallow filling. I'm sorry that I don't have a picture of one of the cupcakes cut in half so you could see how delicious they looked! 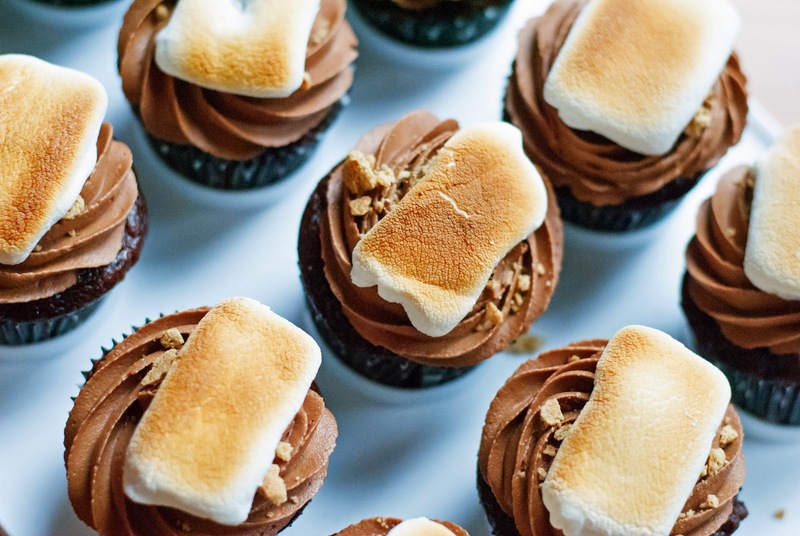 Since the buttercream is made with Hershey's candy bars, it has the perfect milk chocolate flavor that duplicates the melty chocolate in a s'more. 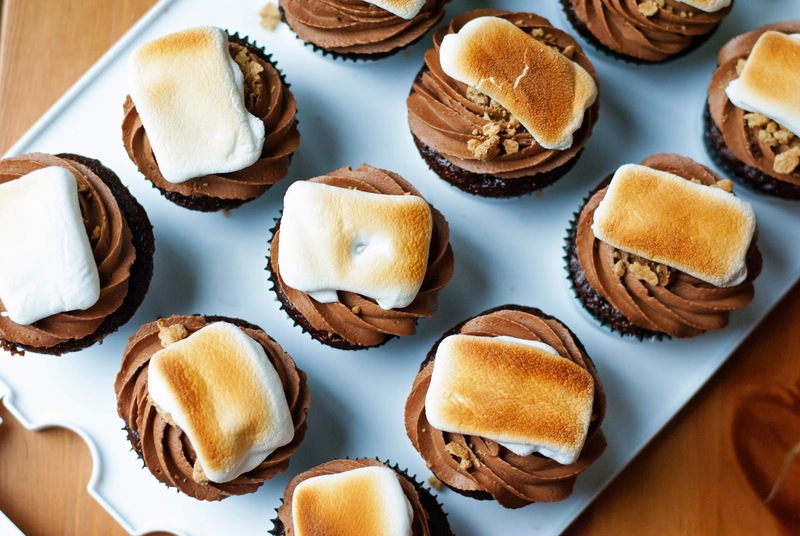 You get a little bit of crunch from the graham cracker crumbs and of course, the star of the cupcake: the sticky, gooey, yet crispy toasted marshmallows puts these s'mores cupcakes over the top! Make these beautiful, delicious cupcakes before the, alreadyflyingbyIcan'tbelieveitisalreadyAugust, summer is over! Preheat the oven to 350°F and line 2 cupcake trays (24 cupcakes) with liners. In a medium bowl whisk together the flour, cocoa powder, baking powder, baking soda, and salt. In a separate large bowl whisk together the oil, sugars, eggs, and vanilla until well combined. Pour 1/2 of the dry ingredients and 1/2 of the buttermilk into the wet ingredients and whisk briefly until barely combined. Repeat with the remaining dry ingredients and buttermilk. The batter will be fairly thin. Divide evenly into the lined trays, filling each one just under 3/4 full. Bake for 18-20 minutes or until a toothpick inserted into the center comes out clean. Let sit for 10 minutes and then remove from the trays to cool completely on a wire rack. Cream together the butter and marshmallow creme until smooth and fluffy. Add in the vanilla and powdered sugar and mix well. The filling should be not be too thin or too stiff, so adjust the powdered sugar amount, if necessary. Melt the chocolate bars in the microwave on medium power, 30 seconds at a time, stirring in between until completely smooth and melted. Let the chocolate cool to room temperature. Cream together the butter and powdered sugar until light and fluffy. Slowly pour in the cream and vanilla and mix until combined. Beat in the melted, cooled chocolate and whip on medium-high speed for about 3 minutes. Spoon the marshmallow filling into a piping bag or zipper baggie with a small corner cut off. Spoon the buttercream into a piping bag fitted with a large star tip (or other tip of your choosing). Using a small, sharp paring knife, cut a small circular wedge out of the top of each cupcake and set the wedge aside. Pipe about a large teaspoon sized dollop into the hole and place the piece of cutout cupcake back on top of the filling. You could also just spoon some filling in but I find piping it is much less messy. Pipe a swirl of the milk chocolate buttercream onto each cupcake and sprinkle with some graham cracker crumbs. 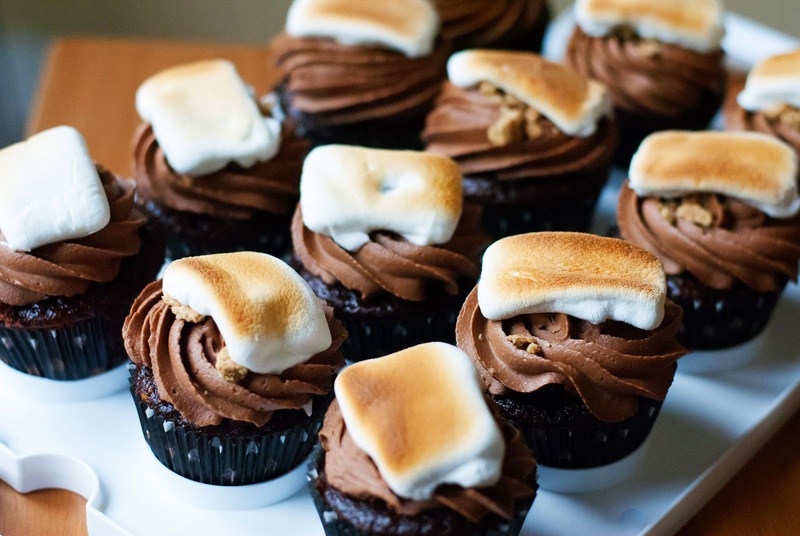 Place your marshmallows onto a silpat or parchment paper lined baking sheet and toast them under the broiler. Make sure to watch closely because they toast pretty fast. You probably will need to work in batches for this step. Use a greased turner or spatula to remove from the baking sheet and place onto of the cupcakes. These cupcakes are best served within a few hours of assembling so if you make the cupcakes ahead of time, make sure to wait to assemble until shortly before serving!